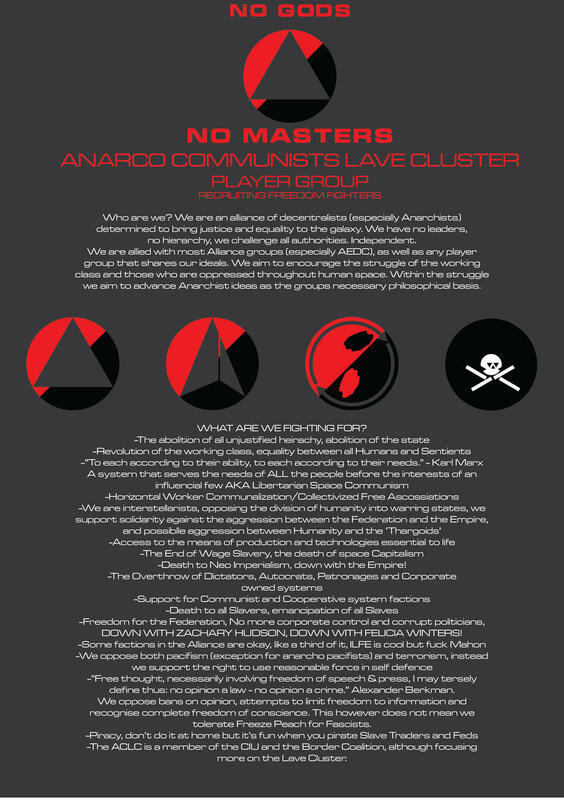 We are the Anarcho Communist Collective/Anarcho Communists of the Lave Cluster/Frontier Alliance, an alliance between Anarchists and Left Libertarians/Libertarian Socialists/Council Communists/Libertarian Marxists. We are members of the Galactic Communist Union and now the Border Coalition, but originally an offshoot of the AEDC. We are now Communists of the Northern Hemisphere of the bubble. Private group is named 'ARGHouse', allies are welcome to join so they can partake in joint ops. Although I prefer playing in Open. Leesti, centre of the Old Worlds and an integral member of the Alliance. For nearly a decade Leesti had been an area of competition between Alliance and Federation pilots, eventually resulting in Federation support for the Fascist 'Justice Party of Leesti'. Continued support of JPL lead to the coup against the established Cooperative government. The coup was successful, and for months the system was under the brutal control of Pat House (until he was assassinated and replaced by his head of secret police). Brutalities against the people of the Leesti system included euthenization, ethnic cleansing, the execution of workers unions, jailing and torture of dissident and the kidnapping of Alliance citizens. No secret was kept hidden from JPL... or so they thought. At the risk of exposure and execution the last vestiges of democracy and free thought went underground, forming into an effective Anti Fascist group called the Anarco Communist Collective. The ACC organised most of the resistance on the surface of Leesti, sabotaging multiple JPL ships and facilities. ACC also helped relay sensitive JPL information to several Alliance groups. Thanks to the efforts of the ACC, Allied fighters were able to decisively crush JPL during the one week Liberation of Leesti. The ACC has much to thank for the assistance from the AEDC and its allies after months of oppression. The ACC now has a permanent presence on George Lucas Station, not only does it intend to aid the Alliance, it intends to seed change throughout the Alliance and revolution in the Federation and the Empire. The LFA was officially formed in 3303, November 4, upon the return of the CIUS Voyager, among many Anarchist Communist, Worker's Cooperative, Democratic Socialistand Democratic Confederalists/Municipalist (if anybody is familiar with Apo and Bookchin) factions/systems on the frontier of the Lave Sector. This includes clusters such as Unelinte, Rians, Wikehali,Kambarci, San Gu and 89 Centauri (Among others). Our goal is to spread Anarchism/Communism and Socialism on the frontier, outside of Alliance borders and to encourage the growth of new player groups. We aim to build an anti-fascist, anti-capitalist and anti-imperialist democratic society, where all sentient life is valued, where no one starves, is left homeless or left to die of disease. Despite giving critique and criticism to the Alliance in the past, in particular Edmund Mahon, the LFA is inspired by the Alliance and would not be around if it where not for Mic Turner, Meredith Argent and actions taken by AEDC and allies in the liberation of Leesti. The LFA means to continue it's good relations with the Alliance, while building what the Alliance was meant to be, built on the ideals of independence, free association, democracy, socialism, human rights, freedom of thought, post-scarcity and ecology. In March, 3304, fighting would break out in Bhutas, between the local Fed corp, and Imperials by the name of the 'Bhutas Hunters'. The LFA militia, after multiple small skirmishes with the Bhutas Hunters, and multiple successful engagements with the last of the ASA, would focus on revolutions in Kebes and Obastini, with a successful revolution at Salam base. This would however lead to a 3 hour first contact war, with the Bhutas Hunters demanding the cedeing of all LFA member systems in their expansion bubble, an end to revolutionary attempts and an unconditional surrender. This however would led to brief armistice, and with the condition in the Lave sector heating up, with the threat of the pending Federal invasion fleet, the free systems of the LFA negotiated a peace treaty with Bhutas. Many peoples of the LFA core and founding systems have yet again taken to a nomadic lifestyle, with the Rians, Kebians, Jukaghans, Obastinis, Aiabans, Yantons, Caillapitians, and peoples of HIP 67389, HIP 65626, the Daesitian rift and even the founding systems of Dijkstra and Unelinte forced to find a new, safe home. Safety is however never permanent in the bubble, being descended from nomads and war refugees our people know this well. A majority of our people seek a new home and roaming space in the north, where we may find safety towards the quiet frontier of Spica. It was however long before even the revolution of Dijkstra, that our explorers surveyed the systems of the Colonia highway, we have found several suitable Earth like worlds between Colonia and Boewnst, one where we hope to continue Dijkstra's legacy of exploration, by jumping Lienward over almost 19 thousand light years, like the voyage of Jaques. There we hope to create a new, perhaps permanent home for the leftist dissidents and revolutionaries of the Frontier. For now our people travel between the north and the old LFA systems, between the bubble and Colonia, where we help out their cause. One day we hope to create our official faction, the Anarcho Communist Collective, out in a Colonia system of our own, where we may coordinate the colonisation of our new leftist bubble. Group membership of the Frontier Alliance is permitted with time in the core region. The Frontier Alliance is in particular a spring-boarder of new groups, though some we have found require orientation before heading further into this mostly uncharted region of space. Knowledge of all LFA systems and members is only permitted with either association with this group or allied status. -We believe in Direct Democracy. We also support Communist and Cooperative governments in power play. We support Fed factions only for the rank and those nice ships, there is no such thing as a good Fed factions, if they have missions where you are undermining another fed faction then by all means take it. We support Independent Communist factions over Alliance factions, although Independent Leesti for Equality is the supporter of the ACC and helped initiate the Leesti Communal Rebellions of 3302. 3. Democracy - avoid anything with 'Liberal' in it. 'For Equality' 'Social' 'Revolutionary' or 'People's' tends to mean that the Democracy faction is likely Democratic Socialist. 4. Indy and Alliance Confederacies, Unionists, Democratic Confedralists and confederacies of Cooperatives. 4. Pitching Feds and Imps against each other. If you want to sow discord among the superpowers then fell free. -We encourage you to also take up any missions that have you killing Feds or Imperials, it gets them confused. Also take cargo delivery missions from the Feds and Imperials, as well as from the list of government types you don't like... And then abandon them. sell the cargo to an enemy station, or if the station has a black market, either way it damages their influence. -While we do not agree with Imperialism, we are aware of Aisling Duval's position on slavery and we are willing to co-operate with Aisling player groups in anti slavery activities. -The group does not wish to interfere in the play style of other players, neither does anybody give orders. There will be a list of ops given which will be completely optional. Everybody can pitch in on ops, what ops do you want? Neither do we condone piracy or random acts of aggression against other players without reason, the only reason being if is a part of an op. Otherwise piracy and raids against NPCs are completely cool. -This is optional, but the main base ATM is Unelinte, lots of good systems around it, you can buy high tech modules down at the old worlds, good bounty hunting in the Old Worlds, Rians and Dijkstra.We are right next to the Old Worlds, which also has the advantage of being a main attraction of many Alliance players, so you can expect some support from the AEDC if ever needed, or help them in turn. Please do not pirate at the home base, not only will you get a huge bounty, but you might also influence the background simulation and cause civil unrest. Then again this is optional, nobody can stop you, but bounty hunting is recommended around home base. -Other areas of interest include Eravate/LHS 3447 area, there are some good value factions there, but many systems are also under the influence of dictatorships. Eravate, LHS 3447 and Chamunda have the possibility of becoming excellent areas of activity on par with Leesti, so piracy is recommended here (Kini is also pretty good for piracy)(After getting blown up by Pheyr in Eravate take ops around the starter bubble at your own risk, don't shoot the new players though). I am not aware of many other areas in the Federation or Empire, except that FN Virginis will give some really good bounty hunting. The Alioth area is also a really friendly place, with some good bounty hunting locations and not to far away from Sol if you ever want to do some raids in the heartland. We also encourage you to go out towards Manite and help our comrades in the CIU . -If you like exploration we also encourage it, after the CIUS Voyager returns from Colonia with its data there will be many new exploration opportunities which shall also be shared with our allies. -Regarding Thargoids and Oresians, I am aware this species might be constructs of the now extinct Guardians. We welcome interspecies co-operation with the Oresians, but we oppose Thargoid aggression, and in turn we are against unwarranted hostility against the Oresians. Yet we are aware that a) INRA used Mycoid on both Oresrians and Klaxians b) Thus Oresrians are quite happy with using our systems as a meat shield against the Klaxians, a cold and yet perhaps flawed strategy. -We do not promote Marxist Leninism/Stalinism/AuthLeft in this group. We however understand that those who are AuthLeft still give their support to indy Communist factions, if you help the Communist revolutions then we are happy to call you a friend. 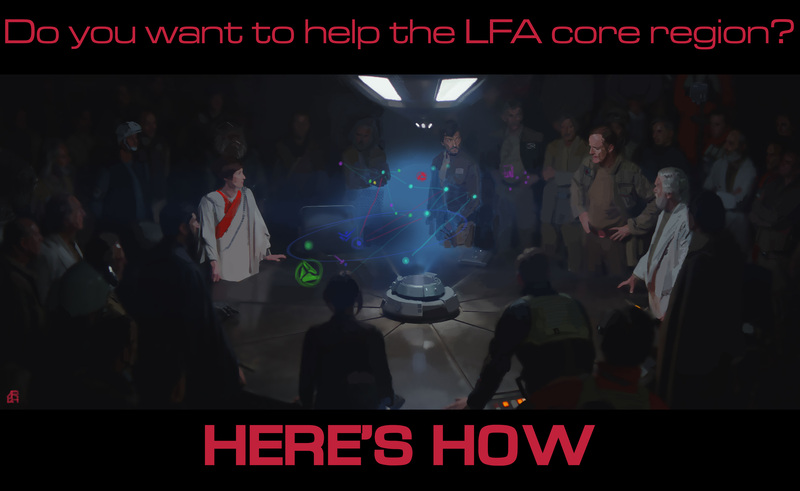 a) All systems and factions associated with the Frontier Alliance do so by choice of free association,and are at any time welcome to leave the LFA without threat of force or annexation. b) All systems are thus independent in their own right, and will never be ruled, dictated or governed by a centralized system wide or interstellar state structures. c) Thus as being part of a mutually agreed upon alliance, no system is permitted to engage in acts of hostility against other freely associating members. d) All members agree to non-hostility with allies of the Frontier Alliance and agree to follow current treaties, including Manites/Alliance treaty, Oguninskmii Treaty, the Border Coalition charter and all others there after. a) All systems and factions agree upon the outlawing of all forms of slavery, be it also imperial slavery or the all to common rental of human beings by corporations, wage slavery. b) All peoples of the LFA are guaranteed an array of rights that are recognized as undeniable, those rights being/including freedom of association,freedom of thought, freedom of religion/spirituality, speech, right to their person, along with the rights to free food, housing,medicine, technology, education, justice services and the right to participate in direct democratic actions/associations, free from intimidation. c) When this charter says free speech, it does not give way to hate speech or acts of violence against other peoples. In the common law hate speech and acts of violence related are illegal and may be acted upon by peoples, be it either the people's militias or victims of said hatred and violence. d) The LFA recognises the right of armed insurrection, especially against Corporate systems, Dictatorships and NeoCon/NeoLiberal Demagogueries. e) If there is ever a centralized ruling body over the LFA, the right to overthrow said body by the peoples of the LFA is recognized. f) The abolition of all unjustified hierarchy is thus recognised. g) Borders are not recognized, and thus all refugees are automatically granted asylum and recognized as full and equal peoples of the LFA. h) The rights of sentient AI are recognised in the LFA. a) The LFA opposes the liberal version of pacifism, the LFA will not ignore fascists nor condemn proletarian insurrection (although it agrees with anarcho-pacifism), but neither agrees with acts of hatred inspired terrorism or imperialist wars for control of resources and populations. b) The LFA recognizes the right to use reasonable force against threats such as Fascism, Authoritarianism, Imperialism, Capitalism and in particular Slavers, inside LFA space and beyond such as the Federation and the Empire. c) In such times of conflict, members of the LFA agree that peoples will not be spied upon, nor intelligence gathered and stored on the peoples, neither in times of peace. d )The breaking of treaties by allies, other groups or even other LFA groups will be dealt with accordingly by LFA members. e) All systems are permitted their own, well maintained and regulated people's militias. On the other hand systems and factions are not permitted to maintain their own military or police forces, and are recognized as being outlawed. f) All members of the LFA are encouraged to act in solidarity of action when one or more members of the LFA are under threat. g) The LFA agrees that it will not join AEGIS, neither will it engage against peaceful Thargoids. The LFA will defend it self against hostilities that are not human in origin, acts of genocide are though outlawed and against sentient rights. a) Peoples will not be pressured into working for another, be it a person, a corporation or even a workers cooperative to fill demand, work is not a requirement. b) Demand can be filled with automation, but will not replace meaningful work of others, nor will it make a profit for one person. Automation is collectively owned. Sentient AI cannot be made to fill demand. c) Demands and Supply are post-scarcity based, nothing that is abundant can be sold for credit and thus available to all who need it. Only resources in scarcity can be sold in credit and the distribution of those resources determined by workers councils, thus the right of belt miners to sell rare materials is recognized. d) In times of scarcity,LFA rights denies traders the ability to sell food, water and medicines to people effected for a profit, at extreme prices too(we mean that profiteers are illegal, we realize that you can or have to sell food at one of your stations to relieve a famine thanks to BGS mechanics). Traders are encouraged to take relief missions that will be compensated, by mission givers, usually in the form of either credits, cargo or engineering materials. e) Worker Cooperatives are encouraged by the LFA, members of cooperatives are required to sign cooperative agreements between workers involved and are permitted and encouraged to form and join unions. e) The LFA does not permit Cooperatives to (and extended to Corporations in LFA space)create, manufacture or grow produce or technologies that either deceive peoples of their true purpose, or harm users. Cooperatives (and Corporations in LFA space) are required to follow appropriate OH&S standards. f) The LFA does not permit the selling of weapons for profit, neither the provision of weapons to powers that are hostile to the LFA and it's allies. Free and regulated distribution of weapons, systems and ships is permitted in LFA space and to it's allies. g) Allies are permitted to participate in LFA shipyard initiatives and Cgs, as well as having limited access to Fleet Carriers depending on their status. h) The development of AI for the sole purpose of military programs is outlawed. i) Slavery, as detailed above in SEC3 and 2 are outlawed, the act of trying to sell or rent another sentient is deemed as an offence punishable with deadly force. j) The LFA permits all it's pilots to equal access to the squadron resources and a free Sidewinder.